Maserati Granturismo S 4.7 MC Shift. Ferrari F430. 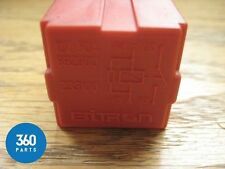 This Red 50A relay is a revised part from the Black Relay fitted at factory Maserati/ Ferrari Models. Ferrari and Maserati Models with F1 Pump Gearbox. Part Number: 313320116. Maserati Biturbo. These were removed from our 1984 Maserati Biturbo E. Windscreen Wiper. Interval Relay. LAY FOR HYDRAULIC PUMP,P/N 155437. Maserati 4200 RELAY. FERRARI 360 MODENA,CHALLEN. This car part is suitable for the following models. Original Maserati micro relay 20 amp. Maserati micro relay 20 amp. Suitable for following Maserati models GranCabrio Sport(4.7) automatic MY12/13/14/15. Gran Sport MY06. Gransport MC victory. Part number: 190829, 60660091, 140503. Fits Maserati Quattroporte M139 V. Without facelift , Lancia thesis (see list above). MASERATI 4200. REAR BONNET SENSOR RELAY 12V. Maserati micro circuit breaker 20 amp. suitable for various positions at Maserati models4200 Coupe, Spyder 4200, Gransport Spyder. Id252948: 82461739 A727520 Maserati 3200 GT Relay module 2001. id252948: 82461739 A727520 Maserati 3200 GT Rele 2001. id252948: 82461739 A727520 Maserati 3200 GT Relais 2001. id252948: 82461739 A727520 Maserati 3200 GT Блок электронный 2001. Id445082: A727520 82461739 Maserati 3200 GT Блок электронный 2002. Parts codes: A727520 82461739. Model: 3200 GT. Engine capacity: 0. Id257634: 82461739 A727520 Maserati 3200 GT Relay module 2001. id257634: 82461739 A727520 Maserati 3200 GT Rele 2001. id257634: 82461739 A727520 Maserati 3200 GT Relais 2001. id257634: 82461739 A727520 Maserati 3200 GT Блок электронный 2001. Id246704: 82461739 A727520 Maserati 3200 GT Relay module 2001. id246704: 82461739 A727520 Maserati 3200 GT Rele 2001. id246704: 82461739 A727520 Maserati 3200 GT Relais 2001. id246704: 82461739 A727520 Maserati 3200 GT Блок электронный 2001. Id257443: 82461739 A727520 Maserati 3200 GT Relay module 2001. id257443: 82461739 A727520 Maserati 3200 GT Rele 2001. id257443: 82461739 A727520 Maserati 3200 GT Relais 2001. id257443: 82461739 A727520 Maserati 3200 GT Блок электронный 2001. Id254070: 82461739 A727520 Maserati 3200 GT Relay module 2001. id254070: 82461739 A727520 Maserati 3200 GT Rele 2001. id254070: 82461739 A727520 Maserati 3200 GT Relais 2001. id254070: 82461739 A727520 Maserati 3200 GT Блок электронный 2001. This item was removed with care from a 2006 QP 4.2 Duoselect. Artykuły z łamane lub nie istniejących plomb, etykiet lub pieczęcie jako nieważne w stanie dostawy. Denominación del artículo Datos del artículo y del vehículo. engine code Товар с поврежденными печатями, маркировками или пломбами расматриваются как не в состоянии поставки. Maserati Mikro-Relais 20 Amp. passend für folgende Maserati Modelle GranTurismo(4.2)Automatic MY8/9/10/11/12/13/14/15. GranCabrio Sport(4.7)Automatic MY12/13/14/15. Quattroporte MY07/08 DuoSelect. Gransport MC Victory. Passt für Maserati Quattroporte V M139. Ohne Facelift , Lancia Thesis ( siehe Liste oben ) !